GreenWorks was hired by Newland Communities to design the 23-acre greenway as part of a master planned community, Reed’s Crossing. The project has been under construction since February of this year and it’s been exciting to see how this impressive project is coming together. 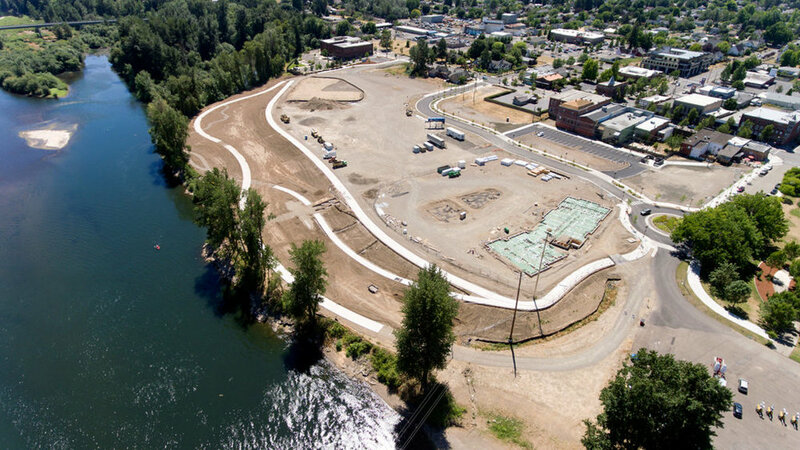 In this progress video, taken September 14 by Mackay Spositio (project engineer firm), the stormwater facilities plantings are thriving while other project design elements are taking beginning to take shape including trails, nature play, and plazas. The project is planned to be complete by the end of 2018. To learn more check out the Reed’s Crossing project page. 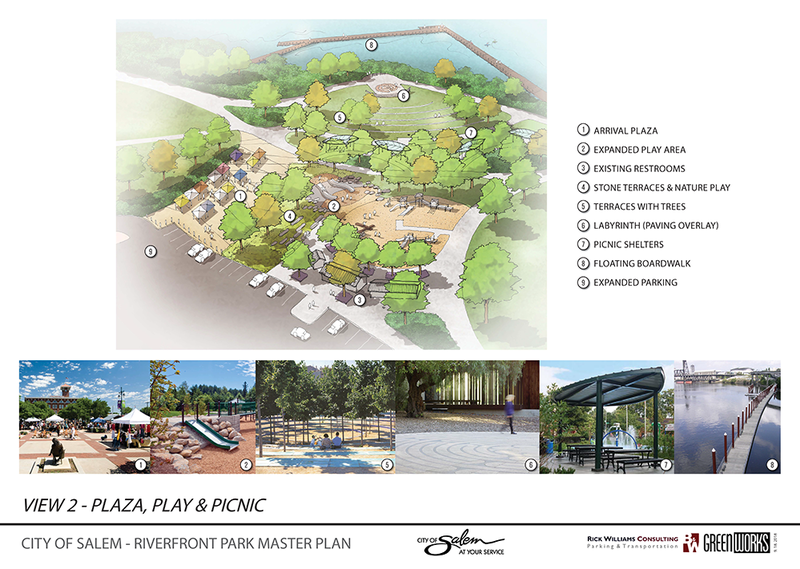 Last night the GreenWorks team, led by Mike Faha (Principal) and Jim Figurski (Senior Associate), presented the Draft Master Plan Concept for Salem Riverfront Park to an audience of 53 interested citizens. 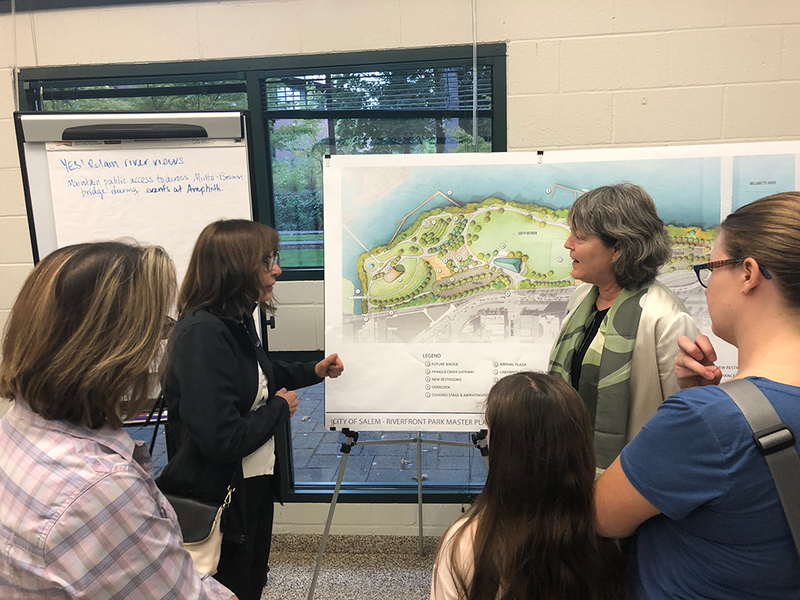 A brief presentation was followed by an open house where the public could view plans and perspective drawings of significant features, as well as ask questions about the Master Plan. The presentation and Draft Master Plan Concept were well received by those in attendance. 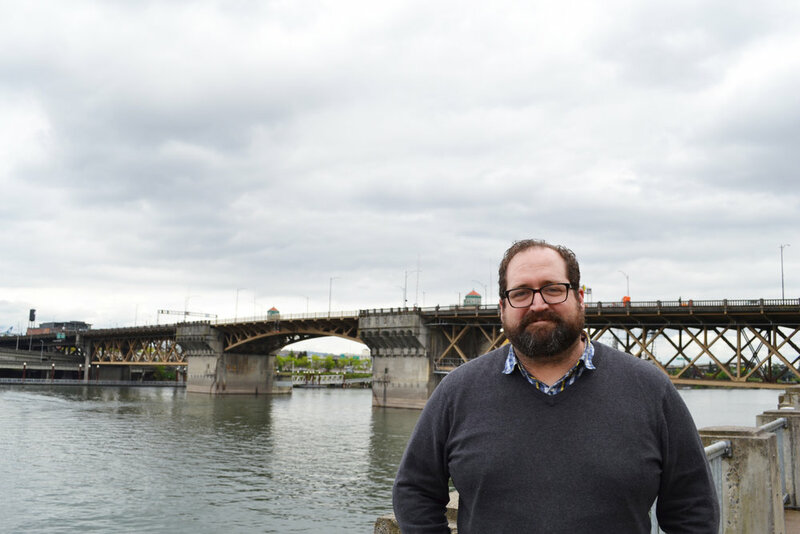 Public comments included appreciation for maintaining a positive balance between open space and paved or built structures; seamlessly incorporating popular park features like the existing playground and splash pad; and increasing access to the Willamette River. The Draft Master Plan Concept was the culmination of a year long process of stakeholder and public meetings identifying key issues that might affect the design, developing programmatic elements, creating design alternatives and gathering public input at each stage along the way. Public input was sought both in live meetings and through online questionnaires on the City of Salem’s website. The surveys gathered more than 1600 responses! Helping with the presentation and open house were Kimi Sloop with Barney & Worth; Patricia Farrell, City of Salem Parks Planning and Resources Manager; Rob Romanek, Parks Planner; and Toni Whittler with Planning and Natural Resources. Rick Williams our Transportation Planner was not present, but a valuable contributor to the design team on traffic and parking issues. The Draft Master Plan Concept will now go to the Salem Parks and Recreation Advisory Board and Salem City Council for approval! Take A Virtual Walk Through Port of Vancouver's Waterfront Marketplace! The GreenWorks team, along with Graham Baba Architects and project stakeholders, has been hard at work developing Port of Vancouver Terminal 1’s preferred alternative for marketplace and landscape design. We are thrilled to say that the hard work paid off. Check out this awesome animated virtual walk-through to get a sense of what this incredible space will one-day become! As visualization and design technology continues to evolve and advance, communities and stakeholders have the opportunity to experience design concepts in a digitally-rich environment. Software like Lumion (a program that integrates with SketchUp to provide real-time renderings) offers our designers both challenges and exciting opportunities to continue expanding and refining their skill sets to provide our clients with the best possible results. Hermiston Festival Street's Up and Watermelon-ing! We’re excited to report that the newly constructed festival street we designed for the City of Hermiston has been rockin’ and rollin’ this summer with all kinds of fun—including this giant inflatable watermelon! Interested in learning more about how this project came to life? 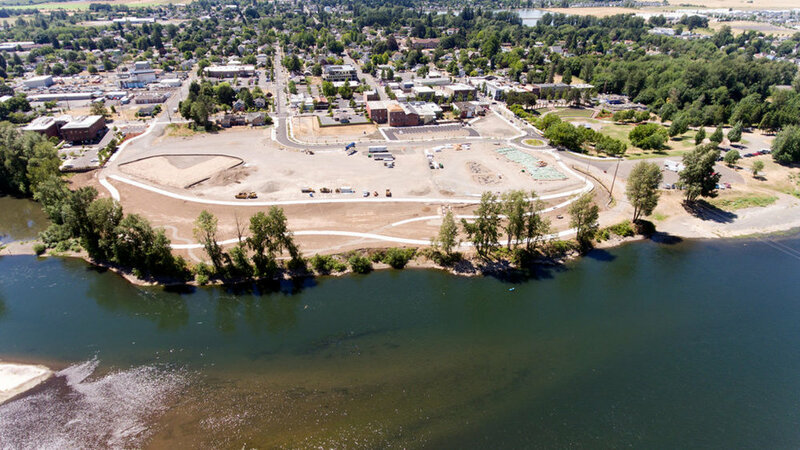 Check out the Hermiston Festival Street project here!